MADRID, Spain (CNN) -- Four boys were killed Saturday when hurricane-force winds caused a roof to collapse at a sports center outside Barcelona, Spain, authorities said. 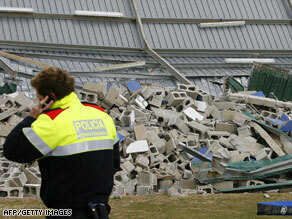 A police officer inspects the site of the roof collapse Saturday near Barcelona, Spain. Nine people, including two adults, were injured. At least six others in Spain and four in France have died in storms that have socked the region, authorities and Spanish media reported. The sports complex collapsed shortly after 11 a.m. (5 a.m. ET) in Sant Boi de Llobregat, a suburb just west of the city, near the Prat airport. The boys who died, who were 9 to 12 years old, were among 17 youngsters playing baseball outside when strong winds began blowing. The adults took 11 of the children into the building, authorities told CNN sister network CNN+. The six boys who stayed outside were not hurt. Earlier official reports that said they had been injured were wrong. Emergency workers thought they had rescued all survivors and recovered all bodies from the building by early afternoon, the CNN+ reporter said. Spanish media have reported winds of up to 99 mph in parts of Catalonia, whose capital is Barcelona. Strong winds have also had much of northern Spain on alert. The winds would signify a Category 2 hurricane, which has wind speeds that range from 96 to 110 mph, according to the Saffir-Simpson scale. The winds toppled garbage containers and other objects in Madrid. Various northern airports had delays, as did high-speed train service between Madrid and Barcelona, authorities said. A Civil Guard officer in northwestern Spain died when a tree fell on him as he tried to clear other fallen trees, and a woman in Barcelona was crushed by a wall that caved in. The severe weather, which began Friday night, has also pummeled southwestern France, knocking out power for about 1.2 million homes, according to Electricite de France. On Saturday, two drivers in the city of Les Landes were killed when heavy winds downed trees that fell on their cars. A 78-year-old man also died after being struck by debris near his home, police said. In Gironde, a 73-year-old woman who was on a respiratory machine died after her home lost power. Regions hit include Pyrenees-Atlantiques, Hautes-Pyrenees, Gers, Haute-Garonne, Gironde, Lot-et-Garonne, Aude and Pyrenees-Orientales, officials said, with fallen trees and damaged roads hindering access. CNN's Per Nyberg and Sujatha Samy-Randy contributed to this report.